Gonzales, LA. 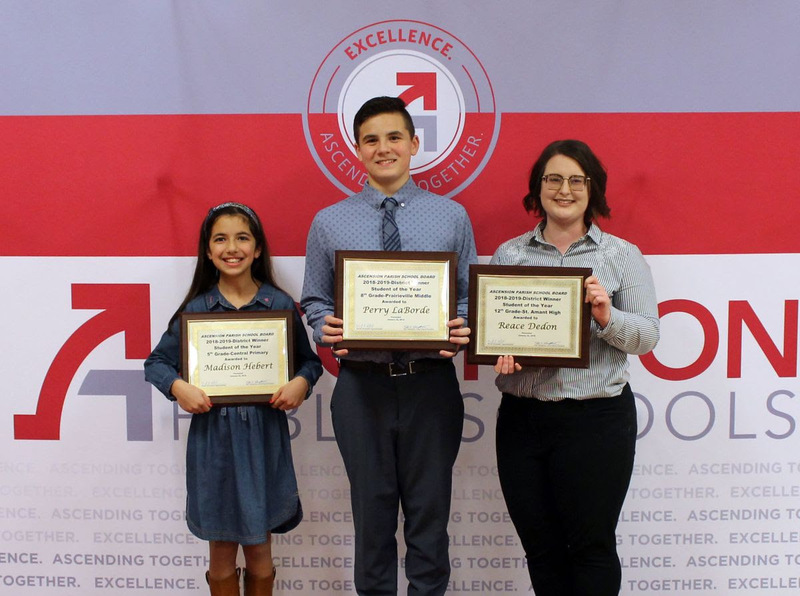 – The 2018-19 Students of the Year were honored by the Ascension Parish School Board at its Tuesday night meeting. 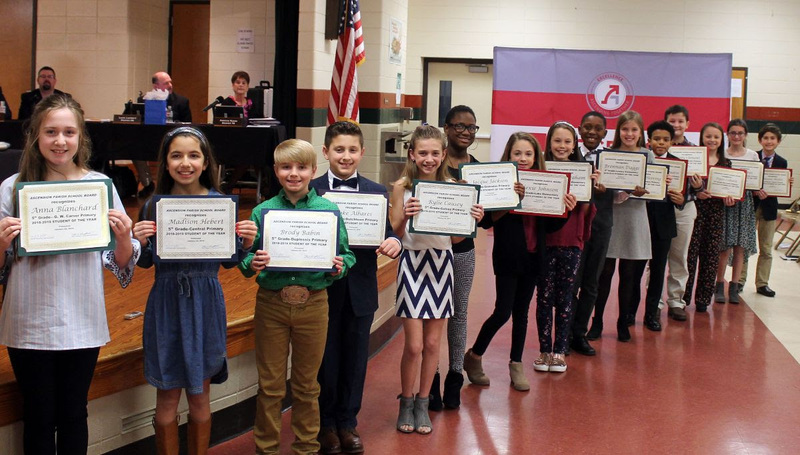 Awards were given to one student from each school plus one district winner for each grade level: fifth grade, eighth grade and twelfth grade. “This is always one of the most enjoyable board meetings of the year. We are so honored to have an opportunity to meet, recognize and celebrate with these outstanding students at this annual event. Congratulations to them, their families, their teachers and all those that ultimately support their pursuit of success. 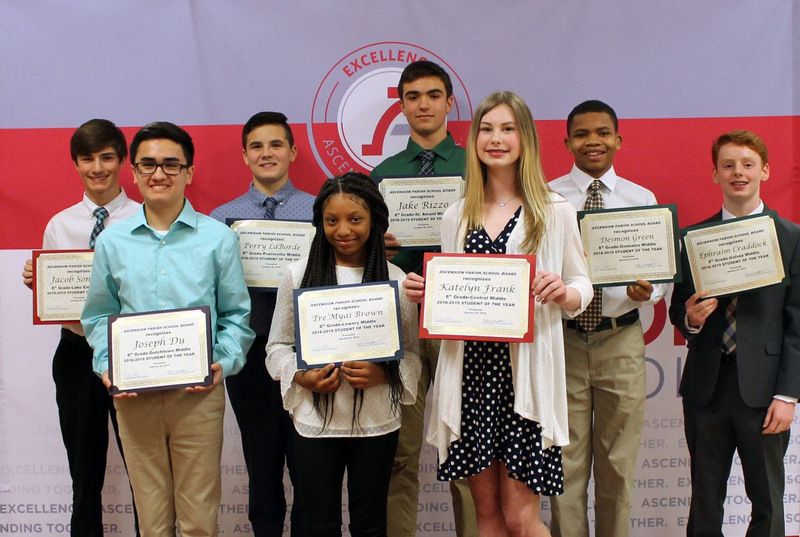 They represent excellence in academics and so much more,” said Superintendent David Alexander. Madison Hebert is the 2018-19 Fifth Grade Student of the Year. A student at Central Primary, Hebert has maintained a 4.0 GPA, is part of the Jr. Beta Club, a member of 4-H and has won multiple Accelerated Reader awards. She is in the Talented and Gifted Program and loves playing soccer, helping others through a variety of charitable organizations and baking. She aspires to become a meteorologist like her idol, Jim Cantore. She is the daughter of Rolanda and Yancy Hebert. Perry LaBorde is the 2018-19 Eighth Grade Student of the Year. A student at Prairieville Middle, LaBorde maintains a 4.0 GPA and is involved in various leadership roles on the school campus and in the community. He excels in Beta Club, has participated and held office in Youth Legislature and is in the Talented and Gifted Program. He has been on the principal’s list and was a Duke Tip Qualifier. He is a Mathlete, in the Robotics Club and has participated and placed in the Louisiana state gymnastics meet. He is a certified scuba diver and plans to pursue a career in marine biology and marine animal protection. He is the son of Brandon and Courtney LaBorde. Reace Dedon is the 2018-19 Twelfth Grade Student of the Year. A student at St. Amant High, Dedon has a 4.5 GPA and is active in numerous clubs, organizations and community activities. During her high school career, she has served as a mentor to incoming freshmen, participated in Beta Club and was a member of the newspaper staff. She has been in the Talented Art Program for the past six years during which time she has published and showcased several art pieces. She served as a reporter in the French Club, was elected vice president of the Thespian Society and received the citizenship award for her leadership and school and community activism. Dedon holds multiple jobs outside of school including an internship with the school district’s Public Information Office. She hopes to attend college in New York where she will pursue her dreams of being a writer and performer. She is the daughter of Jason and Ashlie Dedon. Scroll down for group photos by grade level. Click here or contact Jackie.Tisdell@apsb.orgfor individual student photos. For more information about the Student of the Year process, visit www.apsb.org/page/publications.